Desktop-Reminder is a FREEWARE task planner for Windows to manage your tasks and other to-dos’ in an easy way. It can start with Windows and list all tasks, which are urgent for the current day. For a task with time of day defined a corresponding alarm message will be shown, when the time comes. Why is Desktop-Reminder better than every other task planner for Windows? It can notify you even few months earlier about an urgent task. In such a way you can quit every long-term contract (e.g. mobile phone contract) right on time. There is no need to define time of day for the task - who cares, at what time is grandma’s birthday? No need to input the end time for the task or the task duration - who cares how long the birthday party last. Defining a new task is simple and quick. However if you define time of day for the task, Desktop-Reminder can notify you with an alarm message with a sound in the range of one minute to few hours before the time comes. You don’t miss your favorite TV-program and you don’t bid too late on eBay. What are main features of Desktop-Reminder? How much does Desktop-Reminder cost? Desktop-Reminder is FREEWARE – you can use this task planner for free, as long as you wish, regardless of commercial or private purposes. If Desktop-Reminder FREE is not enough, you can always upgrade it to Desktop-Reminder PRO, which provides a powerful calendar scheduler, task printer, custom sound profiles, categories, sounds, actions, links to external documents and task grouping by year, month, calendar week, task state or category. What others say about Desktop-Reminder? 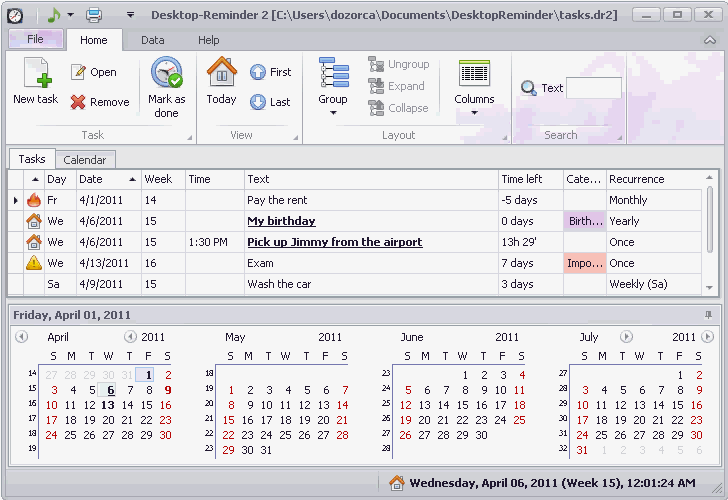 "Desktop-Reminder Free is a great tool which can organize all your tasks and events, bringing order into your life."